Austral was etablished, initially as a shoe shop, in 1946 in Toorak and later as a clothing alterations and shoe repair shop. Manet and George took over the business in February 2008 and expanded the business considerably doing more complicated and wider range of alterations. In 2015, the shop was relocated from Toorak Village to Hawksburn Village and in July 2017 expanded the business and opened a second shop in Kings Arcade. 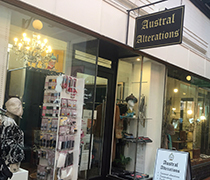 At Austral we do all types of clothing alterations, dressmaking, remodelling and pattern making for women, men and kids clothing.